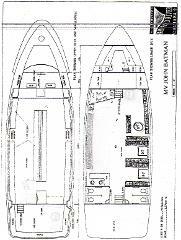 In addition, the vessel also has a mid-level rear deck, a perfect place to chat and perhaps have a coffee and some fresh air under cover, that is also wind free when cruising. The John Batman can board at Gem Pier, Williamstown, or Spotswood by arrangement - avoid the City traffic and parking is easy! Whilst we offer an excellent and popular buffet menu option, our easy and light Finger food options (which includes 10 portions per person) works well with larger numbers - and lends itself to mingling on multi levels. We are a licensed premises, we can also arrange to have refreshments icy cold and ready for your arrival.